We have a data file, manova.sav, with 33 observations on three response variables. The response variables are ratings called useful, difficulty and importance. Level 1 of the group variable is the treatment group, level 2 is control group 1 and level 3 is control group 2.
means tables=difficulty useful importance by group. We will start by running the manova command. After the categorical predictor variable group, we need to specify the minimum and maximum values of that variable in parentheses. manova difficulty useful importance by group(1,3). 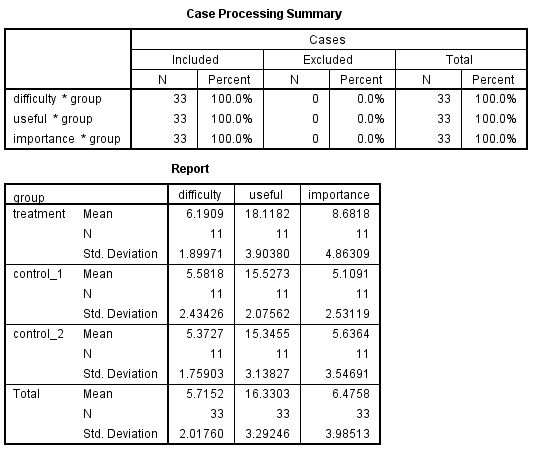 At the top of the output, we can see that all 33 cases in our dataset are used in the analysis. 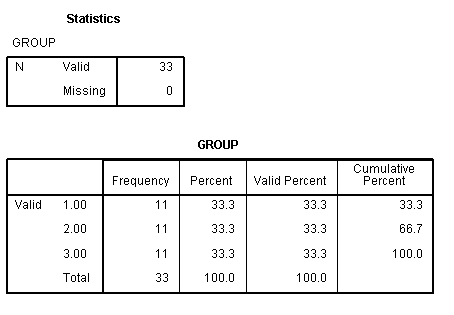 Next we see a table of the multivariate tests. All of the tests of the overall model are statistically significant. 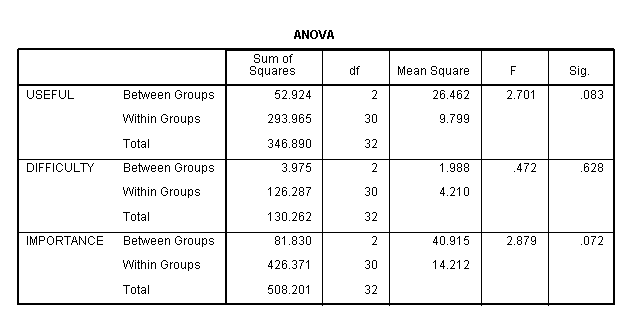 For more information on the various multivariate tests, please see our Annotated Output: SPSS MANOVA. In the third part of the output, we see the tests of the individual outcome variables. Individually, none of the outcome variables is statistically significant at the .05 level of alpha. Finally, we see legend showing us how SPSS abbreviated the names of some of the outcome variables. We will begin by comparing the treatment group (group 1) to an average of the control groups (groups 2 and 3). This tests the hypothesis that the mean of the control groups equals the treatment group. We will also compare control group 1 (group 2) to control group 2 (group 3). The first hypothesis is given on the second line of the contrast subcommand, and the second hypothesis is given on the third line of the contrast subcommand. Univariate F-tests with (1,30) D. F.
We can use the pmeans subcommand to obtain adjusted predicted values for each of the groups. 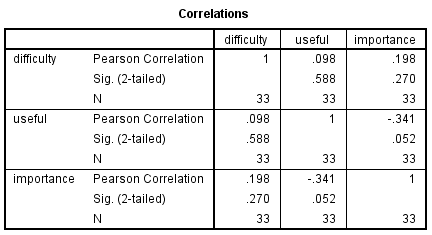 In the first table below, we get the predicted means for the dependent variable difficulty. In the next two tables, we get the predicted means for the dependent variables useful and importance. These values can be helpful in seeing where differences between levels of the predictor variable are and describing the model. Factor          Code                  Obs. Mean     Adj. Mean     Est. Mean    Raw Resid. Std. Resid. In each of the three tables above, we see that the predicted means for groups 2 and 3 are very similar; the predicted mean for group 1 is higher than those for groups 2 and 3. In the example below, we obtain the differences in the means for each of the dependent variables for each of the control groups (groups 2 and 3) compared to the treatment group (group1). With respect to the dependent variable difficulty, the difference between the means for control group 1 versus the treatment group is approximately -0.61 (5.58 – 6.19). The difference between the means for control group 2 versus the treatment group is approximately -0.82 (5.37 – 6.19). Finally, let’s run separate univariate ANOVAs. oneway useful difficulty importance by group. The homogeneity of population covariance matrices (a.k.a. sphericity) is another assumption. This implies that the population variances and covariances of all dependent variables must be equal in all groups formed by the independent variables.